*Note: An additional $25.00 shipping surcharge is required. 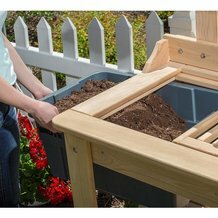 Our custom-designed outdoor potting table provides the perfect area for transplanting, dividing and potting plants. 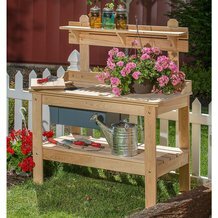 Take your home gardening to the next level with our beautiful, Amish built cypress wood potting table. It's so handsome you could even use it as an attractive serving table for outdoor entertaining. Lehman's says: Thank you for letting us know! We're so sorry for your experience and are looking into this issue to prevent this from happening again. We appreciate your honesty and we're here to assist you if you need anything else. Just give us a call 1-800-438-5346. Suppose to weather to a rustic gray over time says the info. NOT here in California. We've had three rain storms. I've had redwood decking for years so I now how wood weathers...NOT this wood. Instead of weathering it is all black with mold growing on it. Called and was told to try spraying with 10% bleach...now large cracks in major areas...so if you get this make sure you spend the time and $$$'s to put a finish on it as it is NO good without one. Looked nice when it arrived ow looks awful!!!! The original bench arrived with two major pieces damaged. Customer service was great about sending replacements. However, after receiving the replacement parts, the holes drilled for the top shelf, and the holes meant to mount it to the table top did not line up. We mounted the shelf supports loosely to the bench top and then mounted to the shelf to the shelf supports but that took pulling and pushing to make them fit the holes in the shelf. With a combination of that and hammering the bolts in we were able to force the parts into place. However, there were two wooden pieces packed in the plastic tub packed with the bench, with no instructions on what to do with these. It appeared they were meant to slide into a channel beneath the opening in the bench top. When we tried to insert them, one fit properly and one did not. The one that fi=tl was the solid one and the one that did not was the slotted one. The spacing between the rails on the bench top was 14 7/8 inches. The outer distance between the rails on the bottom of the slotted piece was 15 and 3/16 inches. This difference of 5/16 of an inch prevented the slotted piece from sliding into the bench top. 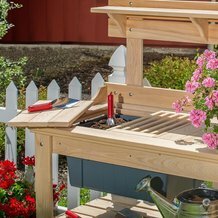 We will ask Lehmans to send another slotted piece that fits, but if you are looking for a potting bench that is ready to assemble when you first receive it, this is probably not your bench. Lehman's says: We're so sorry for the inconvenience. Please give us a call at 1-800-438-5346, so we can sort this out and make it right. On unboxing found I had received two top modules and no base. Lehman's very quickly shipped the missing component and had the duplicate picked up. Couldn't ask for better service. The bench itself is exactly what I expected; solid, functional and pretty attractive. Easy to assemble, too. I'm very impressed with the quality & workmanship of this bench! Plus it looks great. It was well worth the higher price to get such a quality piece. High quality, sturdy, and attractive enough to use as a casual server. And the cypress means it will either weather beautifully to grey, or excel at accepting stain. So glad I purchased it! Excellent quality! Love our bench, beautiful! We just received our potting table and it was better then expected. We had it assembled in less then 20 min. and without modifications. The quality is really good, the sturdiness is excellent, and the overall appearance is a perfect addition to our back yard. Thank you for the fast shipping too! Extremely well built. Assembly directions leave a little to be desired, but still managed to get it together in short order. Its function is perfect and is a welcome addition to my garden area. Very sturdy, well-built, perfect for what I had in mind! Very happy with this potting table! Well made and extremely sturdy. I used it for the first time yesterday and it was perfect and I love the slide in tub for potting mix. So glad I didn't buy a cheap, wobbly one from somewhere else. The finished product is sturdy and very attractive. I put it together alone (60 year old woman) in about two hours. My only suggestion is that it really needs better directions. Once I figured out how to get the top and shelf apart I reused those bolts and then had to take apart again. Small annoyance for a really nice product. Completely satisfied due to the innovative and functional design, high quality materials and ease of assembly. Glad I did not buy one of the lower priced competitive products. Just got this. We agree with all the other 5-star reviews. Very good workmanship, love the stainless steel hardware, the potting soil tub is substantial and well made. We plan to linseed oil it to prevent it from graying. The perfect size--not to big or too small. Will review again in a few years. I received the bench, the workmanship and attention to detail was more than I expected. One corner of the top shelf was damaged in transit, however, one call to Des in customer service had the damaged board replaced and delivered in 4 days. Wow to both the potting bench and to Des!! I will return as a customer. It is absolutely beautiful and almost too beautiful to get dirty LOL. I love the finished product but do admit was not sure how to separate the top and bottom to put together. My Dad 1/2 inch socket wrench came in handy. I would highly recommend this to anyone and after searching and reading a lot of reviews of various lower grade products decided to spend a little more for a Quality product that will last a very long time. If you want something that will last as well as look beautiful for either a potting bench or an entertainment center for drinks or snacks, this is the item you are looking for. Shipped on time as promised. High quality. Easy to assemble. Solid. Once we figured out the hardware, it was very easy to put together. Very solid. Perfect for my shed. Bought the table for my Wife for Valentine's Day and she loves it! Very well made and should last a very long time. Thank you for a great product. This table is wonderful! I am so happy with the quality. I use this in my out door kitchen are and stained it a honey gold to match my other cabinets. I recently used it at an outdoor dinner gathering and my guests LOVED it! Worked perfectly for serving my dinner and goodies. I finally found a QUALITY product!!! The potting bench was packed well, (no styrofoam, which was wonderful.) Each piece was nicely sanded and routed which made it easy to apply a coat of water sealant. The holes were all in the right place and the finish product is beautiful. 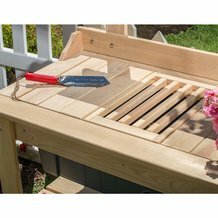 Thanks for taking such good care when preparing this potting bench. I'm sure we will get many years of use out of it. This is a very nice quality solid wood product. It is well worth the price. I can see this lasting a lifetime. The only trouble I encountered during assembly was that two of the top shelf supports had holes that were not perfectly aligned. I know that Lehman's would have help me if I had called but my drill and 30 seconds took care of that. I held off writing a review to make sure it would last and stand up to my abuse. Well, I've had this for afew years now. It was originally going ot go outside but I found it to pretty. It's now my work counter in my kitchen. It went together fairly easily even for one person. My only wish- they make the sme type of table/counter with a solid top or sell a solid top for half the bench. I love this. I'm very short and did cut the legs down a few inches and it's perfect. I purchased this potting table as a gift for my spouse. I looked at numerous models at big box stores and on the net and this was the only wooden model I could find. I really liked the fact it is made from cypress as it will be outdoors in the elements. It looks as good as the picture, was easy to assemble and is well designed and constructed. Two boards were cracked (I beleive it ocurred in shipping). I called the 800 number, explained the problem and had two new boards within two days. Customer service was EXCELLENT; so nice to buy American, have a company stand behind its product, and treat their customers with a smile. In the future, I will look here first. By the way, my wife was thrilled with her potting table and couldn't wait to put it to use! Thanks. Great packaging. Arrived in excellent shape and went together easily. Got this for in my laundry room and it is serving many functions. Looks great and everyone who sees it loves it! I bought this potting bench for my wife for Mother's Day 2012. She loves it! When I finished assembling it, which was very easy, and then put a coat of protectant on it, it looked too nice to get dirty. Sturdy, well-designed product, excellent value for money. This has to be the best-designed flat-pack item I've ever assembled. All bolts & nuts are the same size--imagine that!--so no picking through various-sized items trying to figure out which one is needed. Everything lined up making assembly simple. The item was out of stock when I ordered, so was placed on backorder and supplied promptly upon restock. Great service. 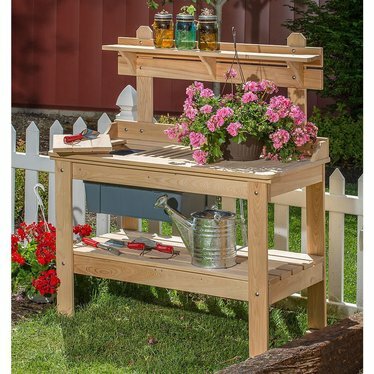 Solid well made potting bench. Easy to assemble. Wasn't sure if it should have been sealed with something like polyurethane or not. Only downside was hardware, which seems to be regular steel that is likely to rust over time. Went out and spent another $20 for stainless steel bolts and washers. the potting table was a very nice product but was packaged terribly; no packing material, loose in flimsy boxes and arrives with major damages. The company did respond quickly and sent replacement places which were packed appropriately.